I am dropping by today to link up with Sarah Grace from gracefully made, Amy from Taking Steps Home and Laura from A Hearty Overflow to share my Christmas Trinkets and Traditions goodies! My swap partner was none other than sweet Laura from A Hearty Overflow. We have so many things in common like our love of photography, sweets, and of course the LORD. Be sure to stop by her blog and say hello! Laura sent me a beautiful angel ornament that says "fill your life with joy." How perfect! 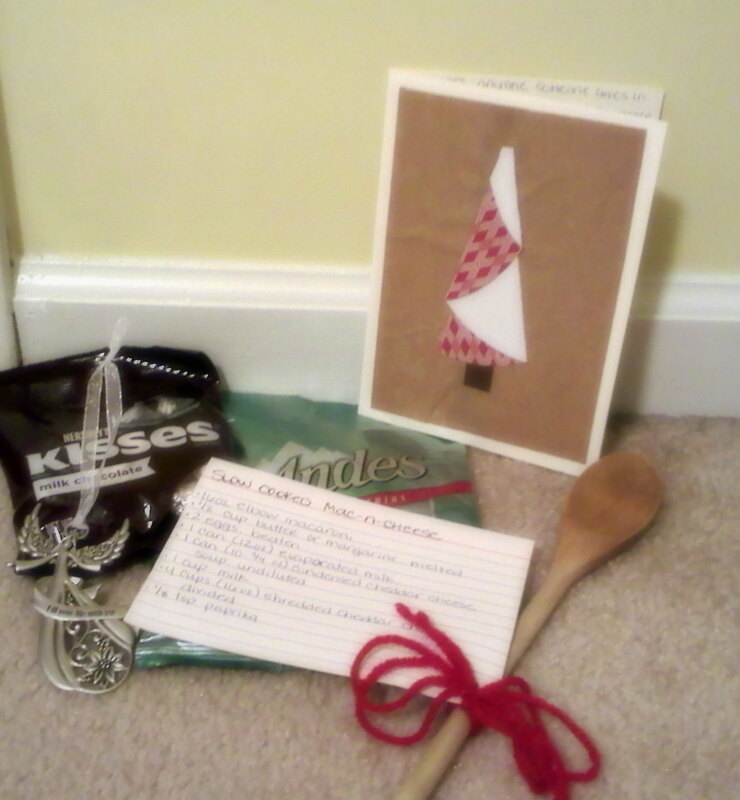 She also sent me some sweets and a recipe for homemade macaroni. Laura, how did you know one of my favorite foods? I also received a lovely card full of holiday traditions that I cannot wait to share with my family one day. Thank you so much Laura for the wonderful swap. :) I loved getting to know more about you and your traditions! It was a great swap! I hope you can join us for the next one. :) Thanks for stopping by! oh my gosh what a sweet swap! It was such a fun swap! Thanks for stopping by! Yay! I had so much fun doing the swap! Glad you like your ornament... and macaroni!! I'm making it this weekend for some friends who helped us move not too long ago. It seriously makes enough to feed an army haha. I loved the swap, especially the ornament! I'm glad the macaroni makes enough to feed an army because I have a boyfriend that can eat as much as an army. Haha! :) Thanks again for the great swap! I love seeing what everyone else received in the swap! Hope you had a wonderful Monday!! I love seeing what everyone else received too! I hope you had a wonderful Monday as well. :) Have a great week! That is a beautiful card, and andes mints...LOVE THEM! I loved my package! Laura is the best. :) Thanks for stopping by! I'm glad you found me Lindsey! I hope you are enjoying my blog. I love a good giveaway so I will definitely come by to enter. :) Thanks for stopping by!